We all talk a lot about eating seasonally and shopping at the Farmers’ Market to get produce at its peak – and yes you know I’m all about that. 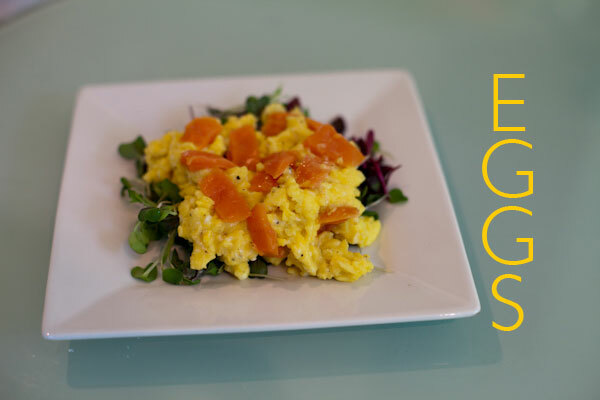 But today I want to share with you a recipe that transcends time and place – scrambled eggs. They can be whipped up on a Sunday morning for a quiet breakfast in bed at home, they can be served at a brunch with friends with lots of crunchy hot buttered toast or a little later in the day for a lazy lunch accompanied by a lettuce salad and they make the perfect supper by the fire in the middle of winter. Eggs any time of day or the year, anywhere in the world – really. I like to make my scrambled eggs in a small non-stick frying pan. 1. Crack the eggs directly into the frying pan, season with a pinch of fleur de sel and some freshly ground black pepper and place over a low to medium heat. Using a wooden spoon mix the whites and yolks together into a yellow batter. As the eggs cook gently mix the cooked in with the uncooked egg until a rich yellow consistency is reached. 2. Just before the eggs reach the perfect state of doneness add the butter, which arrests the cooking process. Transfer to a plate. You don’t want them to get too dry. Top with pieces of smoked salmon and serve immediately with slices of thick hot buttered toast. I like to place the eggs on a bed of microgreens or serve with a salad – depending on the time of day. These are all ingredients I savor. I cannot wait to make this, this weekend! Thanks Lucy. Veggie fed eggs are essential. So are scrambled eggs any time of year. Would love this with that homemade gravlax I have become addicted to! can’t do the gravlax thing – once had a boyfriend who lived on the stuff – now dill on anything sends me back to a bad time in my life!!! I’ll put The Kitchen Diaries on my list! And, I can’t wait to try your recipe. I’ve got all of the ingredients in the fridge right now! How intriguing! I’ve never scrambled the eggs in the pan. I too adore Nigel Slater’s writing and his recipes. What a great way to start the day or any meal for that matter! A simple, yet delicious combo!